Are you searching for used trucks for sale in Indiana but you are not sure of where you should begin looking? It has never been easier to find your next truck than at Acra Automotive Group. We have three separate locations for your convenience. You will find us in Columbus, Greensburg, and Shelbyville, IN. We have many makes, models, and body styles of used trucks for sale choose from at our used car dealerships. This includes Chevy, Ford, Ram, and more. We even have a great selection of budget-friendly used trucks for sale. We are committed to providing you with exceptional customer service and outstanding used trucks for sale. We do this because we do our best to make it easy for you to find a used truck that best suits your style. The Acra Automotive Group website makes it easy to search for your next truck without having to leave the privacy of your own home. You can check out our inventory, get pre-approved, and more. You will find that our online inventory can be sorted by make, model, price, and even body style. You can enter your information on our websites secure online credit application. Select the “Credit Application” tab on the homepage and begin entering in your information. We work with several different finance companies to help get you the best possible rates. Let us do the hard work so you don’t have to. Are you finding yourself stuck at home because your current vehicle doesn’t have what it takes to stand up to the Indiana weather? We have a large inventory of used 4x4 trucks for sale. Four-wheel drive is a great feature to consider when trying to handle rough road conditions. They provide better traction than a rear-wheel drive truck when dealing with less than ideal road conditions. Added strength, trailering capability, and durability are also benefits of owning a 4x4 truck. Make the drive to your local Acra Automotive Group in Columbus, Greensburg, or Shelbyville, IN to check out our inventory selection of used 4x4 trucks for sale. You will find comfort and convenience features such as power windows, power door locks with remote keyless entry, and cruise control. You can even 4x4 trucks with a navigation system or heated driver and front passenger seats. Seating options are also a choice. You can fit up to five or six depending on whether the front seat comes with bucket seats or a split bench seat. These are some significant features you will need to consider before purchasing your next truck. Leather seats are an excellent option to consider. They are great for when minor spills happen because they are easy to wipe down. A wireless cell phone hookup is an amenity worth considering. Wireless cell phone hookup allows you to place phone calls with ease without taking your hands off of the wheel or eyes off of the road. A rear backup camera is a great feature to consider when looking for your next truck. A rear backup camera is not only a great safety feature to help avoid accidents. It also makes hooking up a trailer a breeze and backing into and out of tight parking spots easier than ever. We are certain that you will find the used 4x4 truck for sale that will check all off all of the boxes of your wants and needs for your next truck. One of the fantastic used 4x4 trucks that are currently available at Acra Automotive Group in Shelbyville IN is an outstanding used Chevrolet Silverado 1500 LT for sale. This powerful used Chevy Silverado 1500 4x4 truck for sale comes factory equipped with an impressive 5.3-liter 8 cylinder engine, which boasts an impressive 355 horsepower. 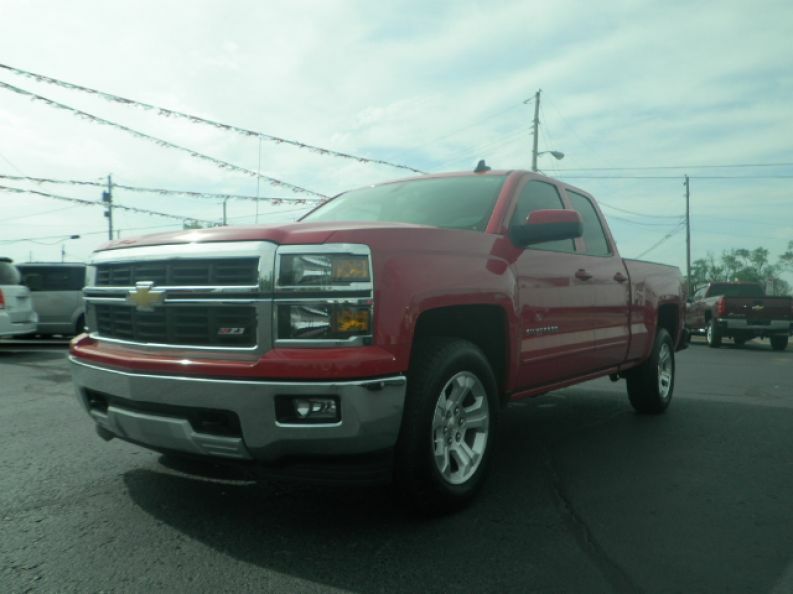 A rear backup camera, steering wheel cruise and audio controls and hands-free communications are just a couple of the amazing features that this used Chevy Silverado 1500 truck comes equipped with at our Shelbyville used car dealership. Whether you are looking for a used truck because you need it for household projects, safety, or any other number of reasons, you can count on us at Acra Automotive Group to have just the used truck for you. Come to check out our used 4x4 trucks at and take one for a test drive today. We know the task of finding your next truck is an important one. We are here to make the experience as stress-free as possible. Our sales team is ready to answer any questions you may have about the used trucks for sale you will find. They will then take you out for a test drive to ensure that it fits your wants and needs in a truck. Trying to decide whether or not to trade in your current vehicle? We take in all types of trades at Acra Automotive Group. Whether you currently have a car, truck, minivan, or an SUV, we will appraise it! So, when you are looking to buy your 4x4 truck, consider getting your old car appraised. Getting an estimate of what your vehicle is worth makes it easier to plan for what kind of used truck that you can afford. It can help lower your monthly payments as well. You also won’t have to worry about selling the vehicle yourself when you trade it in on your next truck. When you pick out your next truck that is just right for you and your needs, have your sales team member get your current vehicle appraised. The Acra Auto Group sales team is ready to answer any questions you may have to get you one step closer to driving home with a smile on your face in the used 4x4 truck that is perfect for you. We are proud to provide the Greensburg, Columbus, Franklin, Hope, Indianapolis, and Shelbyville areas with the best buying experience possible. We are here to guide you every step of the way. From helping you choose the right truck that fits your lifestyle to helping you obtain financing to getting your 4x4 truck serviced. You can count on Acra to be here for all your automotive needs. Contact us today to schedule a test drive of this 2015 Chevrolet Silverado 1500 4WD Double Cab 143.5" LT w/2LT at (888) 318-2272! Or stop in at 1200 East State Road 44 Shelbyville, IN 46176 to check it out in person!